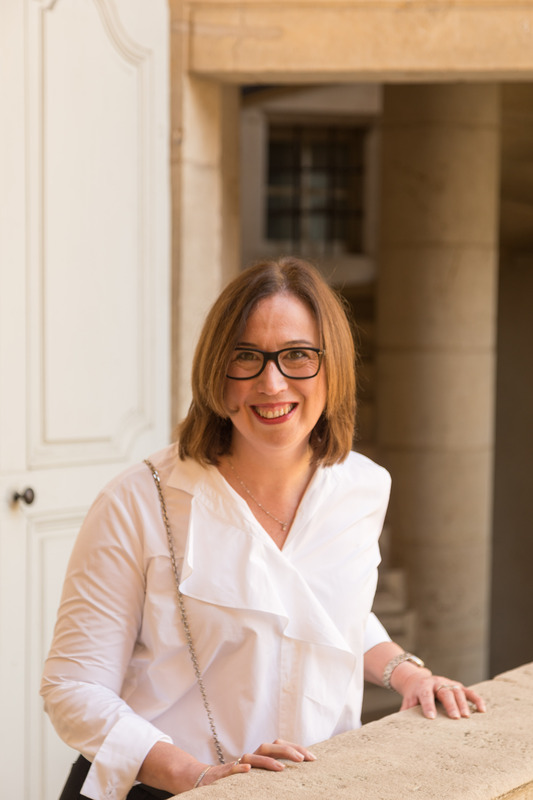 Well, it’s been a long time since I pulled together a ‘French Classics’ post. To tell you the truth, I often find them a bit difficult to position – especially the food related ones. You see, it all has to do the with opposing seasons. Often times, the French recipes that might work well in the height of the Australian summer would make no sense to those of you experiencing winter in the northern hemisphere. And vice versa – rich and warming French favourites aren’t on the agenda when the temperatures are sky high in Oz. Usually, I end up overthinking it and writing about something entirely different. But thankfully, this particular classic works well in any season or climate. And these tasty nibbles are especially suited to celebrations that involve champagne. Meaning they are ideal for this time of the year, no matter where in the world you happen to live. Add in the fact that they are super easy to make, and you are onto a winning French classic. If you’ve not encountered them before, gougères are cheese pastries that originated in eastern France. Unsurprisingly given their origin, Gruyère cheese is traditionally used to make gougères. I use Comté in my version because it is my favourite cheese. But either option works well. It’s worth noting that this recipe is a big one – it will make around 60 gougères. However you don’t have to eat them all in a single sitting. Once I worked out that these little morsels freeze incredibly well, I doubled the recipe. I love the idea of having a batch on hand in case unexpected guests drop by. From their frozen state, you just pop them back into a hot oven until they are crispy again. Feel free to halve the ingredient quantities if you only need enough gougères for one occasion. Pre-heat oven to 200 degrees celsius. Line a large tray/s with baking paper. In a large saucepan, slowly bring butter and water to the boil. Add flour, salt and paprika. Beat rapidly until mixture is smooth and leaves the sides of the saucepan. Remove from heat and allow to cool. Beat the eggs into the saucepan one at a time. 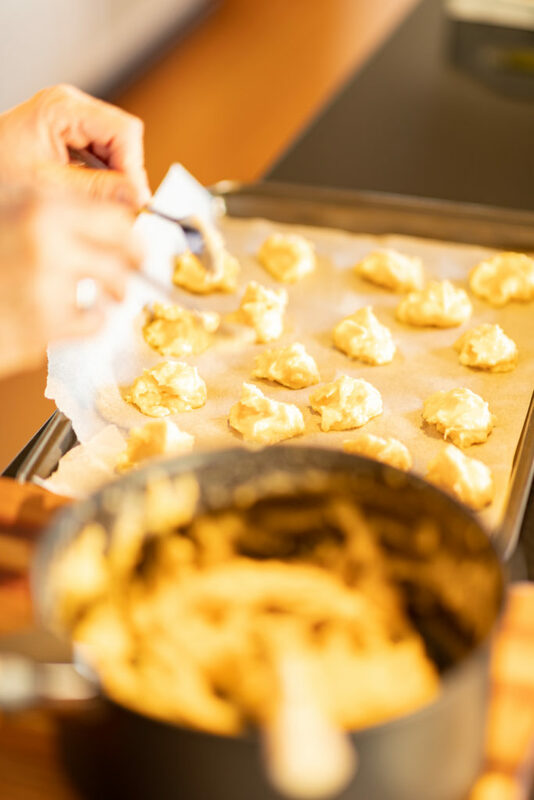 Don’t worry if it seems like the flour, butter and water won’t take all the eggs – continue beating and eventually your choux paste will form. Put heaped teaspoons of the paste onto your lined tray. Don’t overcrowd the tray. Bake until they are lightly browned and crispy. Depending on your oven, this will take approximately 25 minutes. 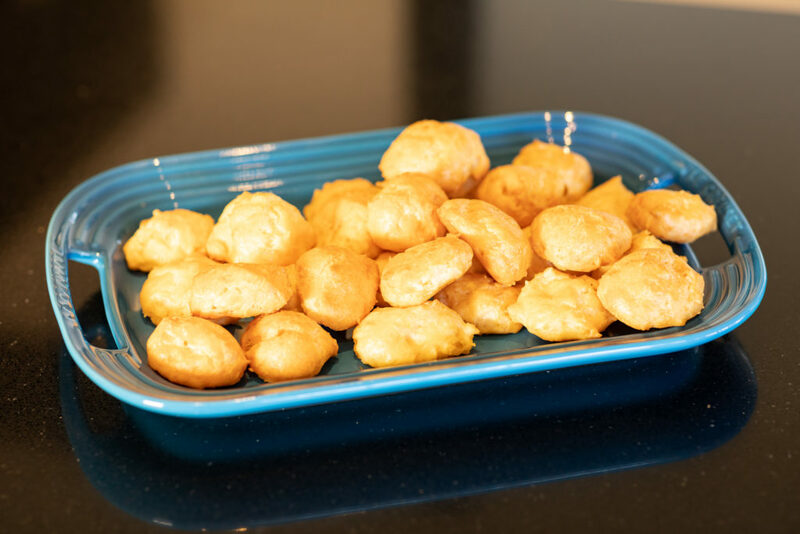 Have you ever enjoyed gougères? And what is your favourite appetiser to serve with champagne? Let me know in the comments section below. I love these with an apéro. Thanks for the recipe. No worries at all Graham. All the best for the new year. I love gougères. Interestingly, the recipe is quite similar to the one for a cheese soufflé, the main difference being the number of eggs, and the fact that you separate the yolks and whites, working the yolks one by one into the béchamel, and beating the whites to stiff peaks (neige) before folding them into the choux paste. In fact, it’s amazing how many permutations can be created with eggs, butter and flour. That’s an excellent point Catherine. I’ve never tried soufflé. I really must get round to it one day. Wishing you a wonderful 2019. I’ll try gougères the next time I host book club. I made a salmon terrine with Paris toasts that went very well with champagne. Salmon terrine sounds delicious Joanne. I hope you enjoy to gougères too. Happy new year to you.